Common Usage: Specifies the ruby structure. Areas: Generates and returns the ruby area. 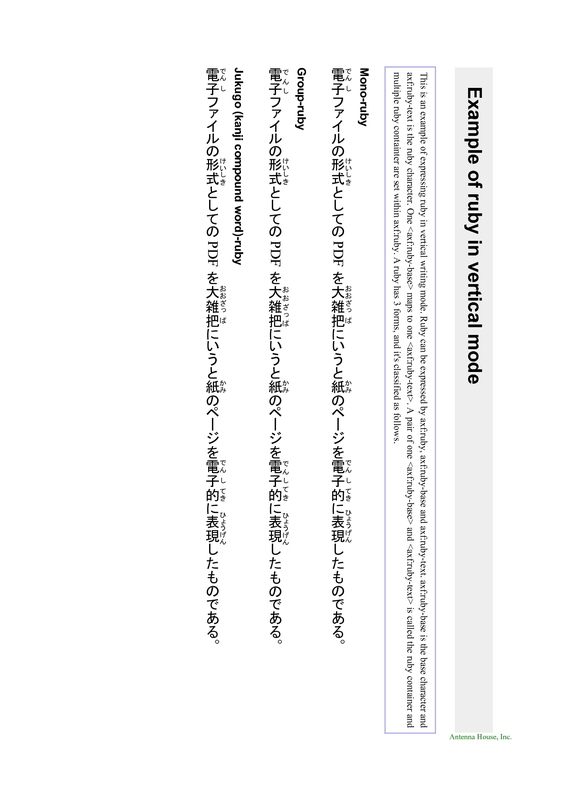 This is an example of expressing ruby in vertical writing mode. Ruby can be expressed by axf:ruby, axf:ruby-base and axf:ruby-text. axf:ruby-base is the base character and axf:ruby-text is the ruby character. One <axf:ruby-base> maps to one <axf:ruby-text>. A pair of one <axf:ruby-base> and <axf:ruby-text> is called the ruby container and multiple ruby containter are set within axf:ruby. A ruby has 3 forms, and it's classified as follows.